The Better Half and I don’t exchange Christmas gifts, and some people think we are a bit Scroogish. That’s so not the case. I love this time of year and I try to soak in as much holiday cheer as possible. For me, this time of year is about spending time with my loved ones. Last week we made a whirlwind trip to Brussels to visit their Christmas market. We went with two friends and we didn’t have a lot of time there, less than five hours. But I tried to pack in as much as possible, including beer, sausage, a waffle with chocolate sauce, and wandering through the market. This was my first foray into Belgium and I really hope it’s not my last. And of course we’ve been to the Christmas market in London. Each year, Hyde Park hosts Winter Wonderland and so far we’ve been lucky enough to visit twice. Another visit may be on the horizon very soon. I’m not the only one who loves this time of year. Here are some holiday scenes around London. Two of the photos were taken on Oxford Street, one of the main shopping areas in the city. I snapped a photo in St. Bart’s before the Nine Lessons and Carols. And one night, I pub I was in was invaded by Santas. At first I thought I had too many beers. Turns out the Santa race has just finished. Even the pubs are feeling festive. We spotted this skinny pub, I think it’s called the Coach and Horses, on the way home the other night and I had to pop in. It was packed inside, but it wasn’t my first beer of the night and I had that warm feeling and braved a half pint outside. I would like to wish all of you happy holidays! And before I go, here’s a photo of Miles. Even he loves this time of year! See ya in 2015 folks! This entry was posted in Life, London and tagged Brussels Christmas Market, Christmas Markets, Christmas Spirit, Hyde Park, London, Miles, Winter Wonderland. Bookmark the permalink. Wishing you a very Merry Christmas. Your post was great! Sending hugs from Spain. Wow! You are really fitting in a lot. Thank you for sharing such beautiful photos. “The spirit made me do it” rather than “the devil” is certainly better this time of year. You should never apologize for too much Christmas cheer. There is no such thing :). I really enjoyed this post, and I wish I had been with you to visit the Christmas markets. They look amazing! And I loveeeeeee Miles’ Santa outfit. He looks adorable. Nothing wrong with no presents. It is spending time PLUS more money for travel 🙂 Love the Miles photo! Love the Christmas market pics. We don’t really have anything comparable in our area of the States and that’s sad, because I like the idea of walking around outdoors on a chill winter day shopping at vendors. I love the pic of the santas with the giant banana and the pink flamingo! And seeing Miles is always a treat. Happy Holidays! so glad someone has lots of Christmas Spirit–and her little dog too.–wishing you a very Merry Christmas TBM and thanks for the cheering up–I will have a beer and toast you over the holidays! Thanks for the tour of Xmas across the pond. It looks festive but not as insane as over here where some people plaster their homes with so many lights, they can be seen glowing from space. 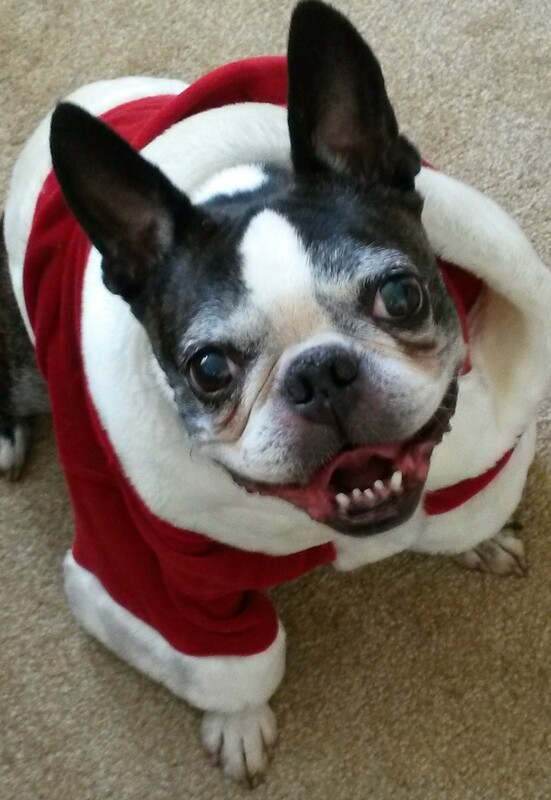 Miles looks adorable in his Santa suit! I guess Att hissed, “No way,” to donning elf apparel. Happy holidays to you and TBH! Duuuuuuuude I’m loving the Christmas spirit you here. Those pics are very cool, especially Miles. And any time a pub gets in the spirit is always good. Thanks for posting the pics. Personally, I think there is no such thing as TOO much Christmas cheer! And I especially love that Winter Wonderland – that looks like so much fun. Loved going on a little holiday tour with all your pics! Keep smiling Miles! 🙂 Merry Christmas to you. I’d love to visit Belgium (especially Bruges), so your photos really got me thinking! It’s funny that you mentioned the Coach and Horses because that was the name of the pub in the book I recently finished, Last Orders by Graham Swift. The name is a running joke in the novel and is the location for some important plot events. Wonder if the author frequented the real-life pub. Happy Christmas to you and yours TBM . Doesn’t Miles look a picture ! It all looks wonderful! We’re off to WInter Wonderland with some of Big Man’s family later this month, looking forward to it. Wishing you, TBH and Miles and Atticus a very Happy Christmas! It all looks so very festive. I hope you and yours have a wonderful Christmas. Tell Miles I think he looks especially handsome in that Santa suit. This time of year is never about exchanging gifts (all the retailers are scandalized) but about enjoying the company of loved ones. Happy holidays, Feliz Navidad, and a very Merry Merry to you and yours TB! Miles looks quite happy and ready to go out and play. Miles should be Santa’s replacement! Yes. Oh yes! I always like looking at the pictures on your blog. They make me wish I was there, too. I hope you have a great time this year, wherever your travels take you. Kisses to Miles (although he looks a bit scary in this photo). Maybe a quick pat on the head? Hope you had a great Christmas and Happy 2015! Miles looks so happy there.